Injury sometimes leads to opportunity. I guess I have made that apparent repeatedly throughout my life as reflected in this blog. Did I injure myself again? Yep! I was not lifting heavy, just doing cable rope hammer curls – only 15lbs and felt something pop in my right shoulder. By Friday morning, I had to help my arm up to do most things and had to prop my elbow against the wall in order to blow dry my hair. I rested and iced it throughout the day and it felt better by the evening, but not good enough to swim. So I spent about 45 minutes walking fast (3.9 mph) on the treadmill. It was better yesterday – that is until I lost my balance trying to pull the boat up to the dock. Yes, I fell in. Splinter in left hand, cut right wrist, bruised right elbow (late addition – appears that I bruised both elbows), and further strained my shoulder. I will see my chiropractor tomorrow (and possibly the massage therapist) to make sure the bones are all lined up and to minimize muscle spasms. 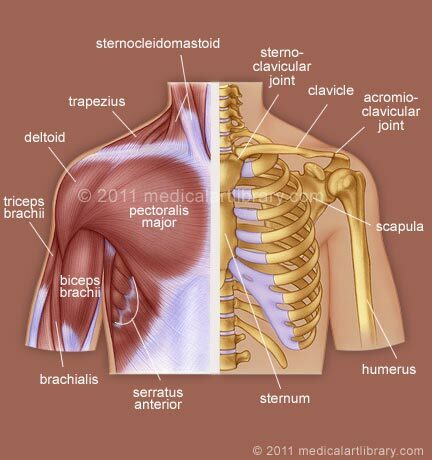 I am pretty sure I strained the deltoid muscle (as you see in the diagram). That is precisely where it hurts. What does this mean for my workouts this week? It means no upper body (above the abs) work. No swimming and no weight lifting that would engage my shoulder. If you read my earlier post, you know that I am struggling with shorts that don’t fit. T, TH, Sa: 10 min cardio warm-up on treadmill followed by total body workouts with higher reps and lower weights (supersetted as possible). And, I will put the bodybugg back on and set my daily calorie deficit at 500 to 750 calories per day. Theoretically, this should yield weekly weight loss of 1 to 1.5 pounds – though anyone who has been down this path knows that this does not always occur. I only plan to maintain this part of my change for the time it takes to lose 7 pounds. The other changes will likely stay in place until my surgery – then, of course, I will be slowly regaining my level of fitness under doctor’s orders. So, this is the plan. I will most assuredly let you know how it goes, for now – I had better go ice this shoulder. Yes it is hard work. But with each injury and roadblock, we get a chance to learn something new. Since my surgery, I have steadily been losing weight despite eating whatever I want. I have no idea what that is about – cannot be losing muscle that fast and my workouts are 2 35 to 30 min walks per day.